Every person working with Children’s Helpers Worldwide is a volunteer, and we are always looking for more people who want to help. Do you want to join us in helping children all over the world? There are many ways to volunteer, from helping at or running a fundraising event, to joining in with our appeals. We always need help when we are running a fundraising event. If you would like to volunteer, please let us know! We are based in London, but have volunteers in other parts of the UK and in other countries too. You can sign up for updates to receive news about upcoming fundraisers, or contact Catherine at catherine@chworldwide.org. We would also love to hear from people who would be willing to hold their own fundraising events for us. Running a fundraiser is very rewarding, and you get to help the children from around the world, as well as having a good time yourself! After the fundraiser, we would keep you updated with news and photos from the project you supported. 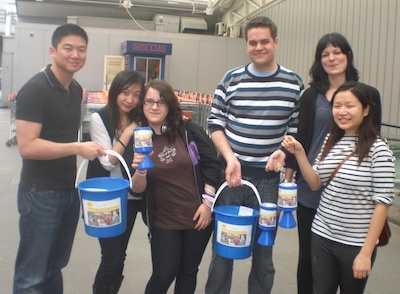 Here are some ideas for fundraisers, which we have held in the past. To fundraise towards building a playground at a Ghanaian orphanage, some students from Aberystwyth came up with the idea of packing shoppers’ bags at a local supermarket. In return, the shoppers would make a small donation. In one afternoon, they had raised nearly a third of the money needed to build the playground! Sophie, one of the students helping to raise money to build a playground at a Ghanaian orphanage, by bag packing at Morrisons. Other past fundraisers have included holding a children’s fun day, arranging a clothes swap, running a coin collection, holding a charity concert and arranging a charity dinner. We always want to hear about new ideas for fundraising too. Sometimes we hold appeals, such as coin collections, where we ask as many people as possible to save their coins for us, over a certain period of time. The more people who join in with appeals like these, means we can raise more funds and help more children. Please sign up for updates to receive news about these appeals.